Robbie Williams’ latest European tour took in all points east and west of the continent throughout the summer, culminating in two shows in the Russian cities of St Petersburg and Moscow in early September. Touring in support of Williams’ 11th studio album, The Heavy Entertainment Show, the production reflected the nature of both the artist and the album, mixing full-on schmaltz with in-your-face entertainment in an atmosphere that was cheeky, loud and proud to be brash. The IntelliPix™XT is a development on from the original IntelliPix™R delivering six times greater efficiency from its nine independently-controlled RGBW multi-chip high-power LEDs which emit narrow 2° beams from their 126mm diameter optics. These are configured in a three by three matrix, with a pixel pitch of 175mm, each of which can be aligned precisely to form highly complex assemblies that deliver large-dimension 3D volumetric lighting effects. An efficiency rating in excess of 95% of its PSU enables IntelliPix™XT to run continuously at full power without any loss of performance. Cunniffe had not used the IntelliPix™XT before so his choice reflected a good deal of faith in the Ayrton brand, “I was looking for a really bright parallel beam to accent and clearly define the star-shaped stage edge; it is clearly an important visual indicator of the show’s character. 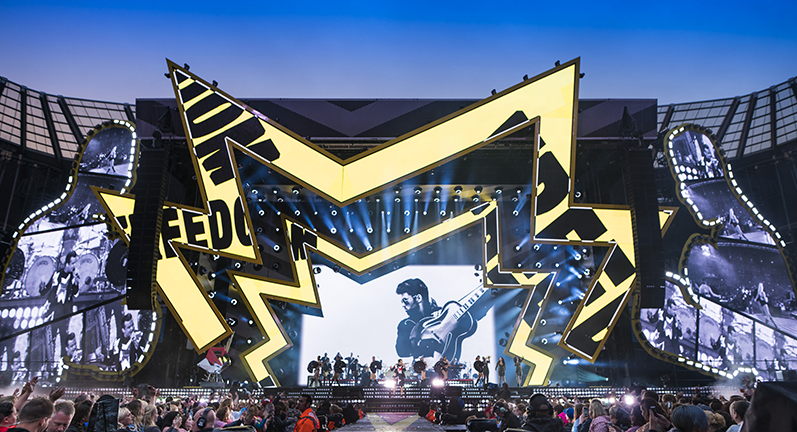 The 200 IntelliPix™XT units were supplied to Robbie Williams’ The Heavy Entertainment Tour by the UK’s favourite lighting hire company, Neg Earth Lights.